With it's high chrome finish, high end lightweight material and super strong construction this is one of the best headsets out there! 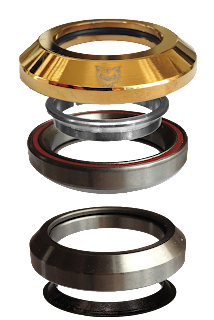 Not only will your scooter (or bike for that matter) gain an eye catching feature, but with the help of the supplied sealed bearings you'll benefit from a superior performance with minimal maintenance! Please bare in mind that this is an integrated headset; this means this is for decks which have the top and bottom cups, moulded into the down-tube.